Some restrictions may apply on our Happy Hour Special. See restaurant for details. 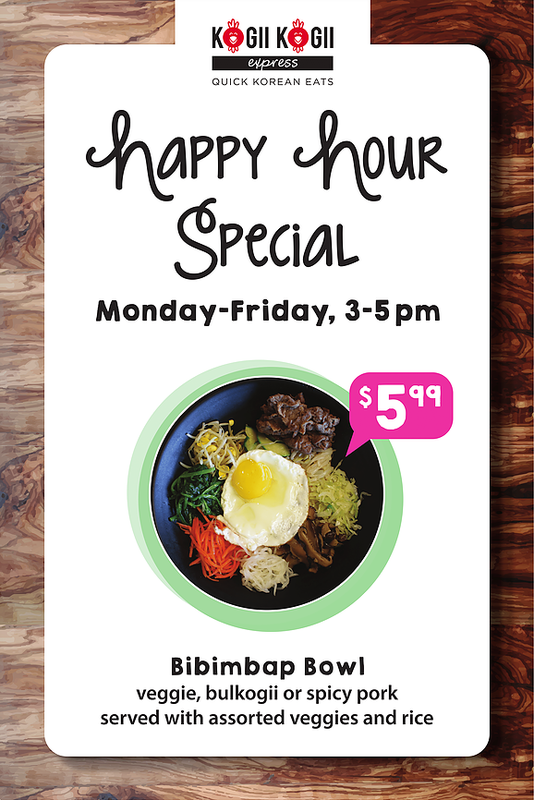 Quick, signature Korean dishes, including Build-Your-Own Bibimbap Bowl, Korean Fried Chicken and Korean Tacos. Plus Happy Hour Specials Monday-Friday from 3-5pm. Bibimbap is a signature Korean dish. The word literally means “mixed rice.” It is served as a bowl of warm rice topped with cooked veggies, meat, and traditional gochujang (hot chili paste) sauce.